* Personalized Your Fitbit Charge 2 Smartwatch Heart Rate Fitness Wristband with this refined replacement wrist band. 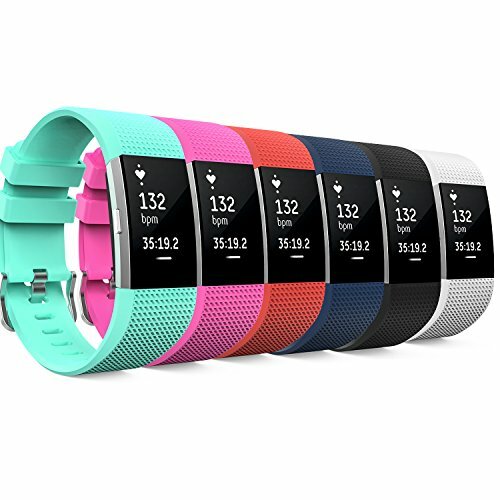 * Band comes with Fitbit Charge 2 Watch Lugs on both ends, which locks onto Fitbit Charge 2 Watch Band Interface precisely and securely. * 6 colors included: Black, White, Red, Midnight Blue, Mint Green and Barbie Pink. * Fits 5.70"-8.26" (145mm-210mm) wrist. Soft silicone with smooth finish for a sporty look. Comfortable and durable. Fits 5.70"-8.26" (145mm-210mm) wrist. Band comes with Fitbit Charge 2 Watch Lugs on both ends, which locks onto Fitbit Charge 2 Watch Band Interface precisely and securely. 6 colors included: Black, White, Red, Midnight Blue, Mint Green and Barbie Pink.